← How Much Fossil Fuels do We Have Left? I know what you are thinking. What does science have to with the fall of arguably the most remarkable and culturally rich nation’s demise? To understand this puzzling question, we first must understand the Second Law of Thermodynamics. Rudolf Julius Emanuel Clausius was born to a wealthy family on January 2, 1822 in Poland. In 1840 he attended the University of Berlin with hopes of pursing a degree in history. However, he discovered a new passion and concentrated on mathematics and physics instead. Clausius became famous in 1850 when he wrote his first paper on the mechanical theory of heat, otherwise known as the second law of thermodynamics. This law essentially states three important facts: 1. Heats travels hot to cold, 2. Heat cannot be converted into useful work, and 3. Every isolated system becomes disorderly overtime. The third part of this law is the most important in understanding the fall of Ancient Egypt. In simplistic terms, as time continues, things decay. For example, refer to the diagram below to look at a snow flake. Snowflakes start off as orderly systems with intricate patterns unique to every flake. However, as time continues snowflakes melt and turn into water. What once was an ordered system, turned into chaos. Disorder is always more probable then order in any system. Ancient Egypt was one of the most influential River Valley civilizations that lasted from 3000 BCE until 332 BCE. This empire outlived Christianity by a thousand years and was already gone by the time western culture even existed. The Egyptians created an empire that they thought would last an eternity. Due to its geological location, it was no surprise that Egypt became one of the most power nations in this region. Being near the Nile River and having fertile land made producing food a breeze. 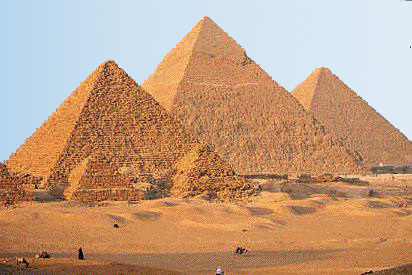 Having easy access to food, allowed the Egyptians to pursue other endeavors such as building the Great Pyramids of Giza (see image below). They also had an abundance of resources to create such huge monuments. Unlike a snowflake, the Ancient Egypt’s transitions to disorder took about 3,000 years. It was very gradual, and can be broken up into 3 main periods: the Old Kingdom, the Middle Kingdom and New Kingdom. As each kingdom progressed, the entropy increased. Entropy measures the degree of disorder in the system. As the entropy increased, this nation constantly got one step closer to destruction. In the path to demise, there where uprising, wars, corrupt rulers, oppression, droughts, and famine. Finally around 300 BCE, the mighty Egyptians where defeated by the Second Law of Thermodynamics. Have you ever wondered why the world seemed to be falling apart? There is murder corruption, war, and greed seen everywhere across the globe on the daily. The world as we know it, moment by moment is getting more chaotic. One day there will no longer be a United States of America or the even the ideas in which we hold dear. There will come a day our civilization will succumb to the Second Law of Thermodynamics. Every day entropy in our system increases; it is just a matter of time before we become like the Egyptians. Interesting post – the parallels with the laws of physics are fascinating. Can’t the US, and other civilizations, however maintain order – and prevent disorder – if they are willing to put in a lot of energy into the system? This is how our body works – we need an input of energy to maintain the amazing organization of our cells, organs, and systems. Likewise, a constant input of energy (and effort) into a civilization can maintain it … I guess the question is will we?